Can’t decide which walk to go and when? Old Hastings Preservation Society Old Town Walk. 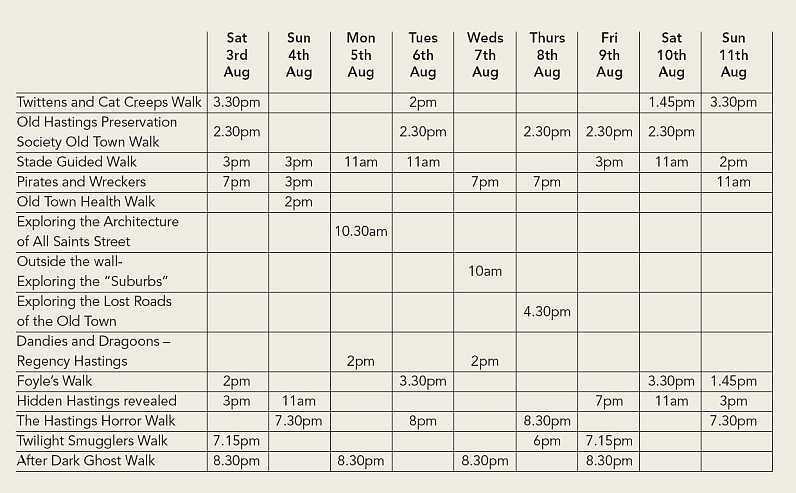 plan your week from this list click on walk. Although there is no charge for these walks, OHPS welcomes donations to the charity. Student groups must pre-book on 01424 420555 or email walks@ohps.org.uk. Steps make this unsuitable for wheelchairs. Meet at the Lifeboat station. Join our volunteer guides for a guided walk of the Stade and explore the history of our unique Fishing Community. The walk takes a maximum of one and a half hours and is free but donations are appreciated to support the continuing work of the Fishermen’s Museum. Maximum 15 people. Walks for groups can be arranged through the Fishermen’s Museum. Suitable footwear advised. If you have mobility needs please contact the museum in advance. nooks & crannies, many with a tale to tell. The tour, lasting approx 1hr 20mins, involves some steps and steep inclines and will include amusing factual and historical anecdotes. Conducted by Clive Richardson, British Tourist Authority Blue Badge Guide. Tickets in advance £4 adults, children £3 under 14, from Shipwreck Museum, Rock a Nore or from guide on the walk at £4.50 adults, £3.50 children under 14. Donation to Shipwreck Museum and OHPS. Meet St Clements steps opposite Swan Gardens, High Street, Tickets Adult £8 accompanied Child £5 no reservations necessary. Duration approx 1 hour 20mins. Dogs on short leads permitted. Wheelchair accessible. Meet Hastings History House 21 Courthouse Street. Tickets £3.50 from Hastings History House The Georgian period was a time of great change for Hastings; explore the evidence in Hastings Old Town and discover the legacy of some of the characters who helped put Hastings on the map. There will be hills and steps on this walk. Meet Chessboard, Butlers Gap, George Street Tickets Adult £7 accompanied Child £4 no reservations necessary Duration approx.1 hour 40 minutes. Dogs on short leads permitted. Includes steps and steep inclines. A trail of discovery through concealed byways, some little known and rarely explored; featuring obscured and obscure evidence of bygone Old Town life. Donation to OHPS.